Sometimes, organizing an exhibition can expand a curator’s job description in ways previously unimagined. I started working with Philippe Vergne on the first retrospective of the work of Huang Yong Ping soon after I joined the Walker in 2003. As preparations for the show intensified this winter, a number of unconventional necessities started cropping up, required by the complex nature of many of Huang’s pieces. A highlight of House of Oracles: A Huang Yong Ping Retrospective, opening next month, will be Bat Project, an installation inspired by the collision of an American spy plane and a Chinese fighter plane in April 2002. The incident set off an intense diplomatic standoff between the two nations. Reading about the event in a newspaper en route from France to China for an exhibition, Huang realized that sometimes art can do no better than life. 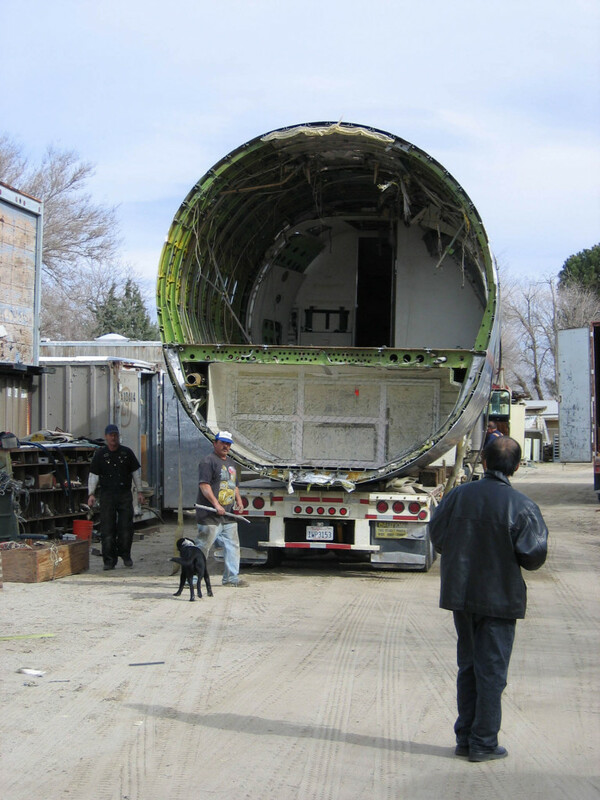 But what seemed like a simple plan–reconstituting part of the American EP-3 plane out of wood scaffolding and aluminum panels–touched a nerve with more parties than one could have guessed. Facing censorship on each of three attempts, Huang has never been able to fully realize the project. When we considered including Bat Project (named after the stylized bat insignia on the US spy plane) in the exhibition, it seemed only fitting to find a real piece of an EP-3. After countless hours googling, I was not quite becoming an expert, but industry names and acronyms that had been previously alien to me–EP-3, P-3, Lockheed Electra, and Orion–started rolling off my tongue. Talking about planes is one thing, but finding one is altogether another. 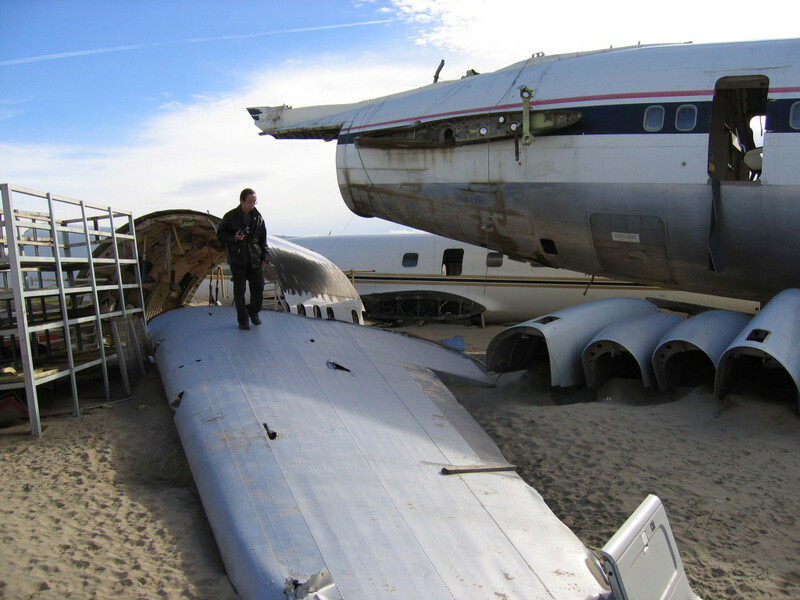 After more sleuthing, we identified an airplane junkyard in the desert highland of California where we might find a decommissioned EP-3. During a visit with Huang at the Walker in January, we decided, rather impromptu, to head to California to check out the junkyard ourselves. One sunny day in February, I picked up Huang at the Burbank Airport and aimed a rented Jeep in the direction of El Mirage. After an hour and a half drive over the Los Angeles Mountains, filled by attempted conversations in my stilted French (the artist speaks no English), we came onto a high plateau. Suddenly, a mammoth, rat-colored military plane appeared overhead, swooping across the cloudless sky, as if announcing that we’d entered a military flight zone. 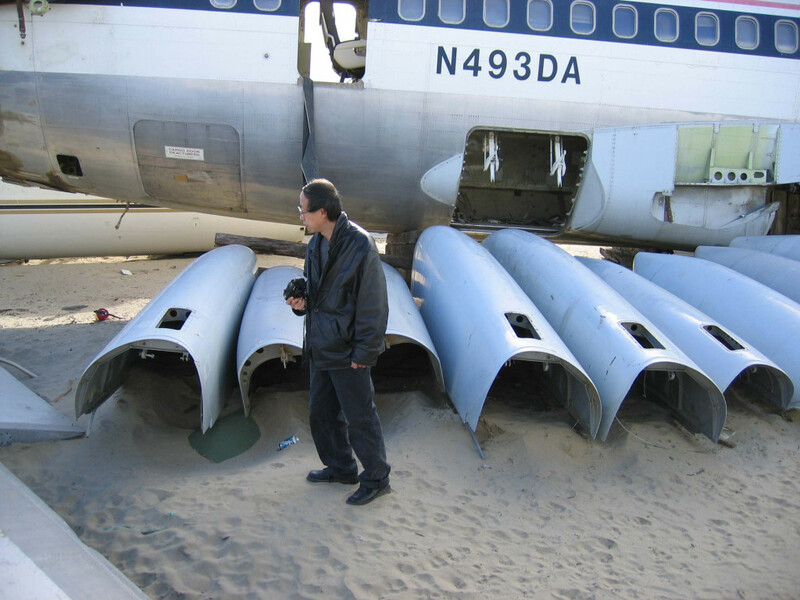 Despite my best effort to be prepared with precise directions and maps, there were a few turn-arounds along the way, but we eventually got there–a bleak but sublimely beautiful flatland littered with forlorn-looking fuselages, cockpits, and piles of airplane parts. Friendly staff invited Huang and I to look around, but we must have made a strange sight–two Asians looking utterly out of place, poking our noses into this industrial wasteland. 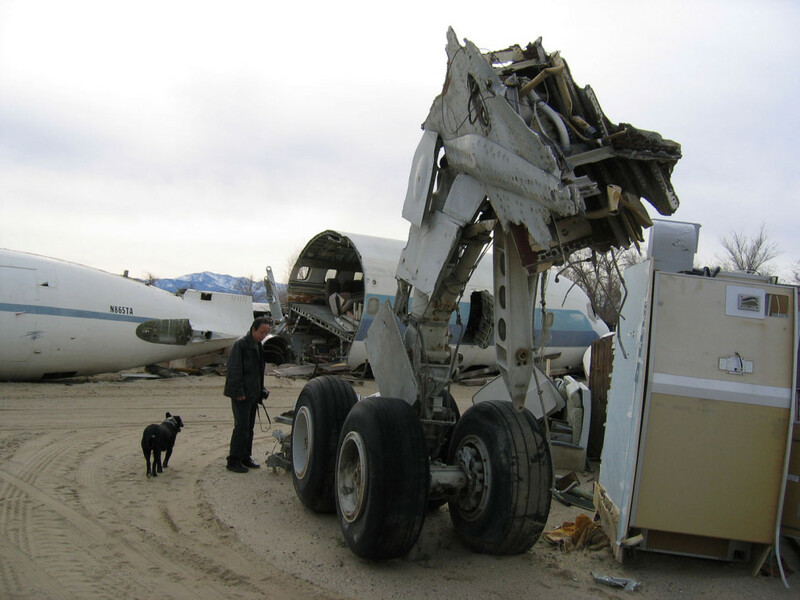 Accompanied by an exceedingly solicitous stray dog, we climbed onto many fuselages–from mid-sized passenger planes and enormous military cargo planes. One particularly awesome Goliath, we were told, had been used for the recent movie Con Air. As Huang thoughtfully took pictures, I followed him around taking pictures of him taking pictures. But after several hours of reconnaissance, we couldn’t find an EP-3. We reluctantly left, a little crestfallen and dusty from the desert winds. But the story has a happy ending. In the following weeks I continued to pursue a lead in the junk airplane dealership (who would have thought?) and eventually located an old EP-3 cockpit. As I am writing these words, it is being cut into manageable sections and will soon be transported to the Walker, where it will be recomposed in an installation work measuring more than 43 feet long and 13 feet high–the first ever fully realized showing of Bat Project. Sometimes life is better than art. And sometimes, art gives us better life stories.